Setting up a convention booth for a trade show or marketing event? Don’t forget to create your own printed tablecloths. 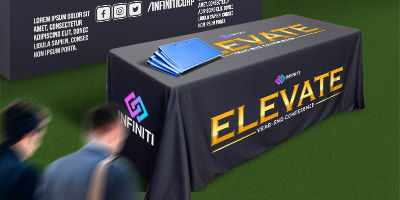 Custom tablecloths (also called table throws or table covers) can be printed with your company name, logo, and other artwork, making your convention booth instantly identifiable.The custom printed table throws can also be used to make ordinary folding tables look more presentable and create hidden storage space underneath the table. Custom printed tablecloths come in 3-sided and 4-sided styles. The 3-sided style has a little less height on one of the longer sides, allowing easier access under the table. This allows for more comfortable seating and provides easier access to under-table storage. 3-sided table cloths are just the thing for press conferences and booths where customers only have visibility in the front. The 4-sided style hides the underside of the table from all angles. This gives you hidden storage space and allows you to show your tablecloth artwork regardless of where you approach it. This makes them ideal for displays that can be approached from any side. All custom tablecloths are made for tables approximately 29”-30” wide (about 2.4’-2.5‘) tall, and the tablecloths are intended to drape 29” on all sides on a 4-sided table cloth and 3 sides on a 3-sided cloth. For more precise placement, you can use the above dimensions and measure the table you intend to use to better account for the size of your design, especially on the parts of the tablecloths that hang off the table. For instance, if your table is less than 29” tall, you can make the design area that hangs off the table a bit smaller so artwork does not reach into the table top. Custom tablecloths are printed on machine-washable stretch fabric, allowing you to reuse them for multiple events. All printed tablecloths are finished with hemmed edges and rounded corners, preventing fraying and giving them an elegant look.